Electronic Arts took a risk last year when they released Dead Space and Mirror's Edge, and while both divided the gaming community in some interesting ways, one can't argue that the risk wasn't worth taking. In releasing these games EA showed a different side of themselves to the industry, one willing to try something new and one that didn't want to just rely on the library of games we usually see from their stable. Both games were also interesting alternatives to the wide range of sequels that we see every year. 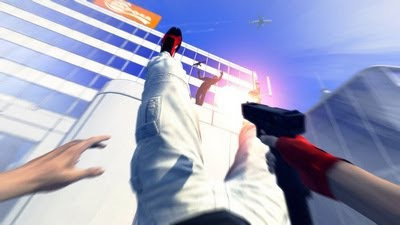 Of the two, DICE's Mirror's Edge stands out to me as the more interesting experiment; it was unlike anything else we had seen before and featured a mechanic seldom explored (though now quite popular) in gaming, that of Parkour. The game featured a mysterious female character who wasn't overtly sexualized and it also had a unique presentation that stood out amongst the rest of the pack. Such a divergence against the norm had the potential to be overwhelming for potential buyers, seeing the game possibly tank at retail and as a result, an EA who wouldn't be so quick to try something unique again in the near future. Thankfully, the game didn't tank and went on to become a reasonable success. It did manage to polarize its audience, but for the most part developer DICE can be proud that it created an experience that was popular enough to make the risk worth it. It's no secret that I found Mirror's Edge to be incredibly frustrating, but the thing I'm pleased to know is that the problems that annoyed me in the game are mishaps of a developer trying something new and different, perhaps even trying to innovate. They are examples of perhaps trying too hard to stand out and can be easily fixed with some refinement for a sequel. With this in mind, it's easy to forgive DICE for these problems and focus on the positives of the game, of which there are many. Starting with the obvious, the game's presentation is gorgeous. Relying on a visual aesthetic that intentionally separates it from the crowd, it conveys a sense of wonder and beauty that few other games manage to achieve. The colour scheme, using deep blues, stark whites and vibrant reds makes the game's landscape unique and inviting, resulting in a city that is thoroughly enjoyable to visit. DICE wanted the game to stand out and as such the unique aesthetic wasn't chosen purely for delivering eye candy, it was also chosen to represent the city as seen by the eyes of the game's protagonist, Faith. In her eyes, the city is cold and brutal, the whites and blues demonstrating this almost sterile perspective. The reds show us another perspective; Faith is a runner and as such she must traverse the rooftops in order to deliver messages to and from civilians, the red 'Runner Vision' mechanic showing us routes across the various buildings as Faith spots them. It's an effective mechanic, aiding the player by showing them things they may not have seen beforehand whilst also working with the game's presentation to effectively communicate what it's like to see the city in Faith's eyes. 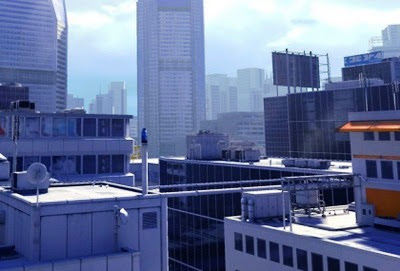 This convergence isn't just tied with the game's visuals, Mirror's Edge's soundtrack was also carefully selected to represent certain aspects of the game. Still Alive, the main theme song was chosen due to its gentle piano keys and the soft, alluring voice of singer Lisa Miskovsky. The game's chapters on the other hand, use more electronic tunes, complimenting the urgency felt by the player as well as Faith's heightened senses as she escapes from her attackers and chasers. Subtle sound effects such as Faith's paced breathing, the thud as she lands from a jump and the sound of rushed footsteps behind getting closer only further add to this sense of agency, making the experience all the better for it. Unfortunately DICE also dropped the ball a little with Mirror's Edge. I've already spoken about my frustrations with the controls and I've also mentioned the dissonance seen in the presentation of the game's narrative and gameplay, but these aren't the only flaws. Combat is a common thread of discussion in forums and blogs because it is mostly unnecessary. I can understand why it was included, but it takes away from what the game should be about and its core mechanic, Parkour. While designed with a fight or flight mentality, some sections of Mirror's Edge essentially force you to fight due to their compact, constricted level design and the AI's quick reaction to shoot you on sight. This completely slows you down and makes you separate each enemy so they are easier to take down, as taking them on in a bunch will most likely result in Faith's death. This is the complete opposite to the main idea of the game and it breaks up the flow that is so integral to a game supposedly about Parkour. Whether combat and enemies were implemented incorrectly (having some chase you in later chapters added to the intensity and was quite thrilling) or their inclusion was a mistake remains to be seen, in the meantime it's an aspect of the game that hardly anyone enjoyed and is one of the key things DICE should focus on if they pursue a sequel. The narrative is another thing that needs work, as I found it to be relatively boring. Don't get me wrong, it starts off decently enough with Faith and the other characters being intriguing and even quite mysterious. Unfortunately this soon disappears in favour of a plot that is quite cliché and predictable, a typical setup and revenge story that we've seen all too often in the past. Rhianna Pratchett's script does the job and mostly allows the game to focus on the important bits, running and jumping, but as it is it's also a massive let down. It has (had?) potential so this is disappointing. Faith and her associates are all interesting, believable characters, who seem real and are therefore easy to relate to, however due to the story being predictable and boring, interest in their lives wanes quickly. This is quite a change from what we're used to seeing in games, the over the top characters and generic stereotypes, so it is a welcome addition, but they're just not explored well enough. We barely get any background information on key characters and we get a brief insight into Faith's past before shifting focus into the present. Later on in the game a few events happen that had the potential to be impactful on the player, but unfortunately due to the lack of exploration of these characters and their personalities these moments don't affect us in any way and are almost meaningless. In a time where narrative possibilities in games are being explored by the likes of BioShock, Portal and Braid, this can only be disappointing, especially when it's easy to see the potential and where the game could have headed. Instead we have a predictable story that we already know the ending to and one we will probably forget about in the years to come. Thankfully the rest of the game stands out -- from the thrill of Parkour to the fresh and unique visuals -- making Mirror's Edge a game that will be memorable for years to come. It wasn't perfect, but for a first attempt it was worth the effort and thoroughly enjoyable to play. The risk was justified and that can only be a wonderful thing going forward in this industry. Of all the AAA games I've played in the last 10 months - GTA4, Fallout 3, Far Cry 2, Assassin's Creed, etc - Mirror's Edge is the one I'm probably most interested in, like you say, moving forward. I won't be happy with just a polished sequel though. The kind of jump I'm looking for is like the one from Far Cry to Far Cry 2. At the top of my wishlist is co-op mode with Faith and her sister. No game I know of has attempted to explore that kind of family co-op dynamic - games are either about two bros or a main male character with female love interest sidekick. Prince of Persia really pushed animated interactions, conveying flirtations and dependence and whatnot, but it was still an incredibly boring shallow relationship. I think if done properly the physical interactions between two sisters cooperating and saving each other's lives could convey some really powerful emotions. Michel -- Wow, what an awesome idea! I would never have thought of a possible direction like that so now that you have mentioned it, I couldn't agree more. It would totally work as a continuation of the narrative too as Kate was saved and the sisters are back together. The family co-op dynamic would be very interesting to explore but it'd also be very interesting to play: Faith as the runner and Kate as the cop (ex-cop?). Both would have different skills and moves, possibly even motivations and it could lead to some really great gameplay opportunities. Plus, Mirror's Edge already established these two as the most interesting characters, so further exposition on them in the sequel in that direction would be really awesome to see. Thanks for stopping by mate, it's appreciated.